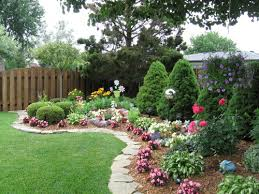 Inspiration before Perspiration – You could hire a landscape designer to plot your lot, but if you are reading this, there is a good chance that you are ready to save some money as a do-it-yourselfer. There is a vast array of books, magazines, and websites to draw ideas from for your landscape design. Don’t forget to check out Pinterest and your friends’ and neighbors’ yards, too. Most people are proud of their yards and are willing to give you permission to snap a few photos. Some communities have house tours that include showing off the best gardens. Good ideas can also be found in public parks and botanical gardens. Test your Soil – Know what you are dealing by testing a few soil samples. This information will help to pinpoint the correct additives that are needed to improve your soil and correct the PH balance. Different plants have different needs. Consider choosing plants that are suitable for the soil that you already have and save on additives, all together. Go Native – Choose plans species that grow naturally in your region. This reduces the expense and worry of special treatment. It also insures a degree of success that will build confidence for the beginner. Once your plantings are established, you can always experiment by adding new and even exotic species gradually as you become an expert gardener. Divide and Conquer – Many plants, like iris, need to be dug up and divided every few years. Plan your landscape for expansion of these types of plants. Many perennials, like hostas and daisies, spread every year and can be divided and replanted. Plants that reseed themselves like pinks and bachelor’s buttons will self-propagate year after year even though they are annuals. Start small and give your plants room to expand year after year. Share – Once your plants are established and you have become competent at dividing and replanting, and collecting and saving seeds, it’s time to branch out. Trading with friends, relatives, neighbors and co-workers is a time honored tradition and an inexpensive way to establish new plants in your landscape. If you need more sources, check out garden clubs, community gardens and online want ads.